Well for a change I've managed to chalk one up to me rather than the fox, although I did loose a chicken the other day but I'm not sure to what. I shot this vixen about 30 yards away from the bottom chicken pen. It's the time for year when they get brave, so with lambing fast approaching I'm pleased to have removed this potential problem early on. Like with many of my hunting and shooting posts, I was in two minds as to post this post or not as I know how people get when it comes to animals, but I see things very black or white. This fox is a predator and the animals that I keep on this little homestead are it's prey. I don't see shooting this animals as something to be enjoyed, I see shooting it as a necessity. well done mate. 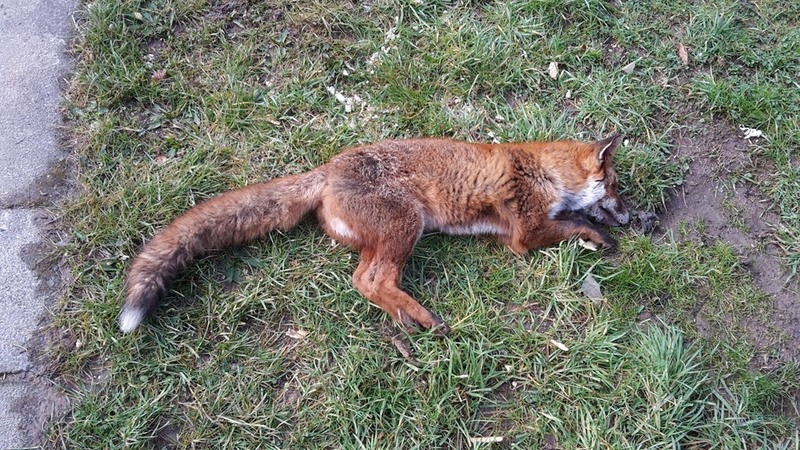 There are many antis online waiting to bash troll a shooter with the "the fox was only doing what comes natural to it as a predator" well last time I checked a humans eyes were in the front of it's head, we are a predator, the apex predator and eliminating threats to the animals we steward is part and parcel of being top of the food chain. a fox doesn't kill for dinner it goes in to frenzy and kills every single bird, not worth allowing them to live around your flock. so again, Well Done! Out of interest did you take it with rifle or shotgun? Your dealt with it in an human way, I kept chickens back in 70's until a fox got in, most horrible site ever. Your last line says it right. Come and shoot mine now? I can't get it! I think that man is the predator, if we choose to keep animals then we should make sure that they are secure. Maybe you should get a few colours in your life and not see things in black and white, life isn't black and white, every living thing deserves a life. That fox may have had babies and you have not solved your problem as there will be another fox in his or her place, but then I expect you will shoot that one also. You do what you have to do. I love raccoons. I will shoot one if its going after my hens. I have 3 hunting dogs (mutts), so far, the raccoons haven't come into my backyard. I am totally with you on this, Kev. Well done for posting the blog. We hate to take the life of one of the many wild animals around us, and do everything we can to make the livestock we raise safe and secure. But there are times when eliminating a predator has to be done. You did it in the best way possible. Shame on you. Perhaps you should invest in better chicken housing rather than shooting wildlife. Yes, surely more secure animal housing, fox proof? Despite the myths, foxes don't kill for pleasure, they kill to eat and feed their young. Same as protecting your apple trees from the rabbits to feed your family or whatever you do with your fruit. They are the indigenous wildlife, the chickens are not. Too bad there are many more where that one came from. We have coyotes and they will eat fox when they can catch them. The foxes will dig up and eat yellow jacket(hornet) nests so it seems everything kills something. Perhaps don't display your trophy? Are you getting it stuffed? Absolutely don't have a problem with shooting foxes, it's a humane way to get rid of these pests. I would hesitate about shooting at this time of year though as they may have cubs - not as illogical as it may sound, they are vermin too, but death by starvation is somewhat less humane. The fox problem where I live is huge but because it's an urban area shooting them isn't really an option. Good for you, it died a quick death. I don't agree with hunting foxes in any way shape or form, but protecting livestock is totally necessary. As someone else pointed out we are stewards of the animals in our care, if we put them behind fences we have to protect them from a fox on the rampage that would kill them all in a feeding frenzy, not just take one for food. If the fox has young then that is a shame but it is not your problem, you have only done what you had to do. The folk that are saying 'shame on you' and 'disgusted' have obviously never seen what a fox can do to a flock of chickens in minutes. Well done for being brave enough to post this photo. I wish I hadn't seen this. I'm going to go away now. Kev - i applaud you for being brave enough to post this! and this is coming from a person who saves flies that get in the house, saves mice that get in the house, doesn't kill mosquitoes if i can flick them off, and generally a lover all of god's creatures. however, when you are trying as hard as you are to be self-sufficient, grow your own food, raise your own animals, all to feed your family in the best way possible - then you have to do what you have to do to protect that sustainability. we apparently have a bunch of coy-wolves in our area - we hear them all of the time. we also have black bears in the area and bobcats too! and an array of hawks and falcons plus lots of bald eagles. if anyone thinks that sweet little kymber wouldn't grab her remington in order to protect one of her cats, herself or her husband - then they don't know how i truly feel about all of god's creatures. i will try and save birds, field mice, flies - you name it! but if any predator comes into my path - they will be disposed of in a humane and quick manner - JUST LIKE YOU DID! i applaud you again for having the balls to put up this post! I liked your post. Nice to see you doing what needs to be done and having the guts to show it. I suppose I should remind you of the rule of modern rural life. It is called the three S rule.... "Shoot, Shovel, and Shut up"
A Fox once killed my whole run-full of hens (about 15). If I could have shot it, I certainly would. Bleeding-heart townies might think that cruel, but we country people know what's what. Are you allowed too? Over here you aren't allowed to shoot a wild animal just to protect your own livestock. You need licences and permits and written dox.. and it must be in the season.. You're allowed though to put up a sign saying "shoo, fox! Get away!" Has it ever occurred to the people complaining about you killing the vixen that there are proven cases of foxes taking babies from cots and prams? Some folk need to check facts and get their prorities sorted! Just had our own run in with a predator in pour poultry pen. Unfortunately for us, it is a native animal- quoll- which we are not permitted to shoot. It's tough sometimes. And killing is definitely not something I enjoy but foxes here are a pest. Yes, a controversial one. Since they banned fox hunting with hounds, a popular method of control here, the foxes have become more of a problem. 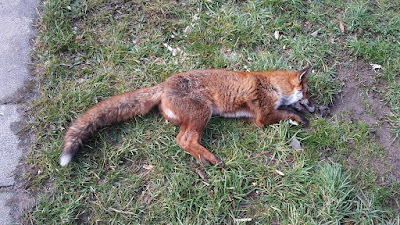 I've heard all the arguments from the antis, but none of them (or very few) have ever experienced the damage foxes can do to chickens and lambs. I love fox, I can recognize his big tail from far away. Good for you killing/displaying this one.